This Italian Southwestern concoction is hearty enough even for non-vegetarians. 1. Preheat the oven to 180 °C (160 °C for fan assisted ovens), gas mark 4. Grease a 1.5 litre baking dish with oil. Heat the 1 tablespoon of oil in a large frying pan and cook the onion and pepper, over a low to medium heat, for 10 minutes, adding in the garlic, chilli powder and cumin for the last minute, until softened and fragrant. Stir in the black beans, chopped tomatoes and salsa and bring to a boil, then remove from the heat. 2. Mix the ricotta with the egg, in a small bowl. 3. Spread 1/3 of the bean mixture over the bottom of the baking dish. Lay half the lasagne sheets over the top, slightly overlapping. Top with half the remaining bean mixture and then spoon the ricotta mixture over the top, spreading carefully into the sides. 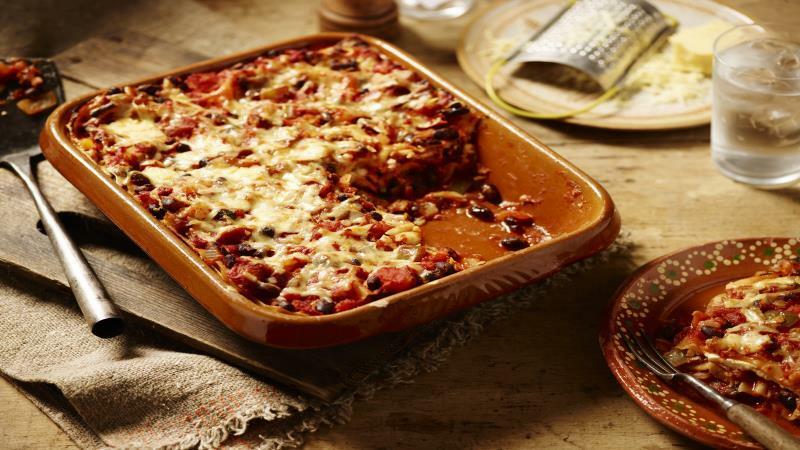 Top with half of the cheese, then with remaining lasagne sheets, bean mixture and cheese. Grease some foil and place on top of the dish. 4. Cook in the oven for 30 minutes, then remove the foil and continue to cook for 10 minutes, until just turning golden. For an extra golden topping pop under a hot grill for 3 to 4 minutes. Make it meaty – add 500g cooked and shredded chicken to the bean mixture. Use a combination of different beans if you fancy a change.